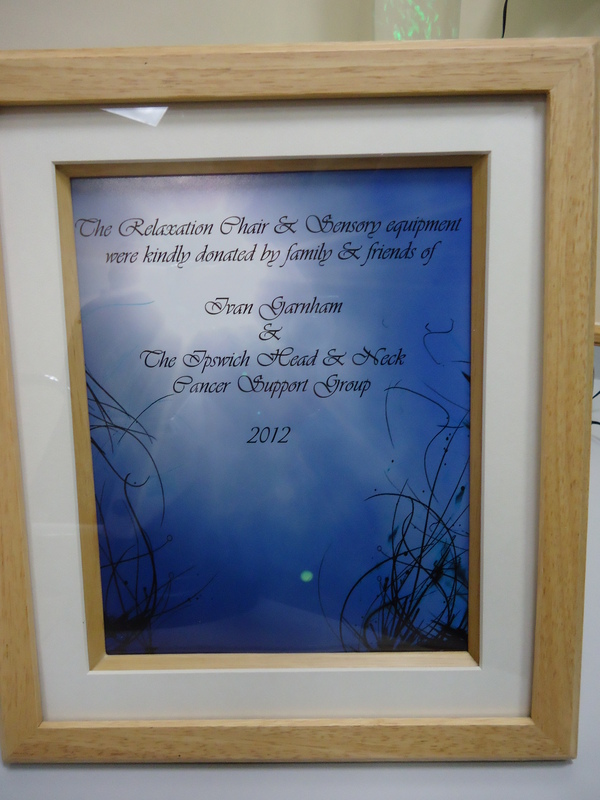 This is on ongoing project that started by the group getting a kind donation from the family and friends of one of our valued and much missed members Ivan Garnham. We tried to think of something that would be of practical use and benefit to Head & Neck cancer patients now as well as something that had benefited Ivan while he was a patient. 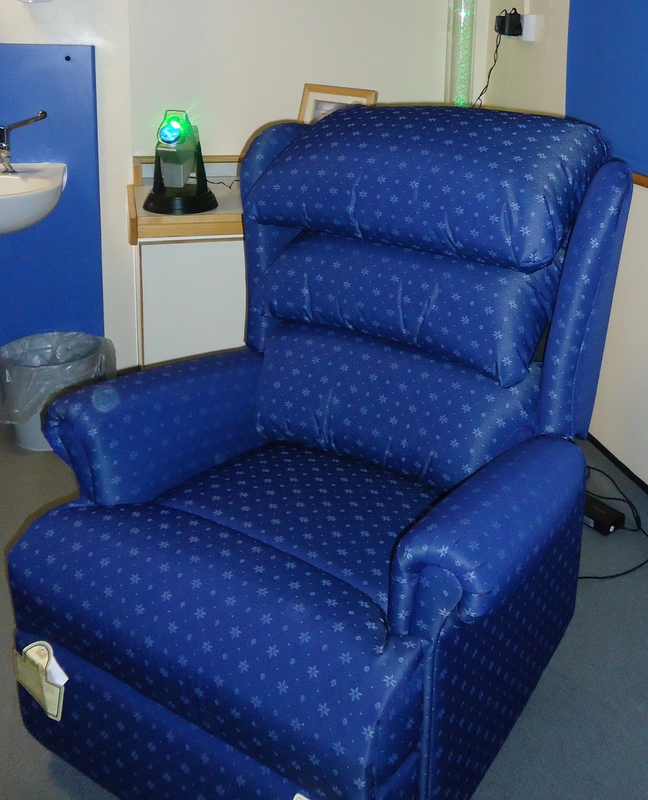 We started by listening to a request by our chairman Amanda Ford who practices complementory therapies at the hospital along with her other role as a Macmillan Radiographer specialist, for a comfortable reclining chair for patients to relax in while having therapy. 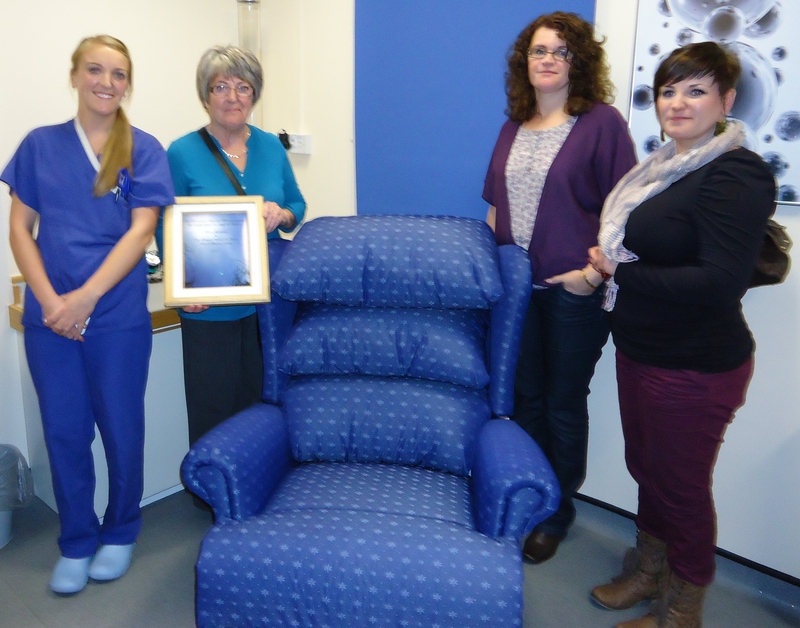 The idea grew and with the help of the team and staff at the Radiotherpy dept we were allowed to provide not only a chair but sensory equipment that would all stay together in one of the rooms in the dept. They provided the room with additional darker blinds so that the equipment could be used more effectively and we set about looking for the right chair and equipment. 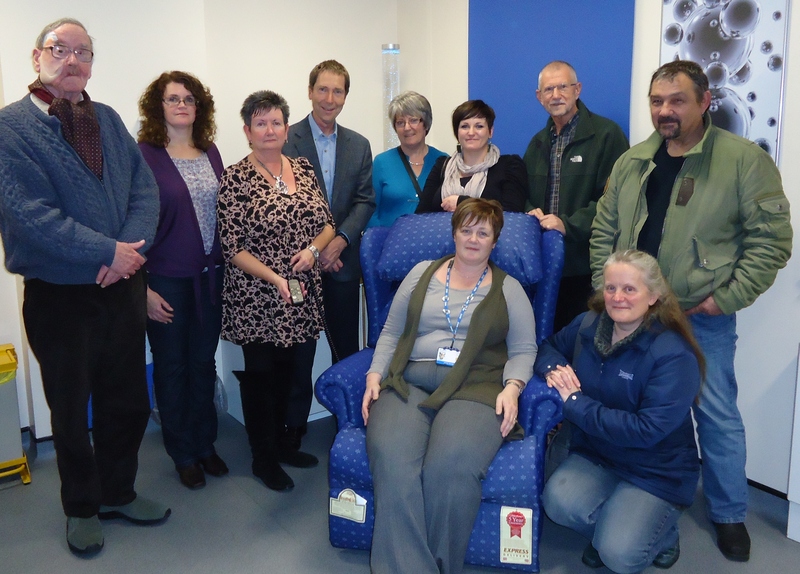 It took us a long time to come up with a chair that satisfied all the rigid requiements for it to be used in a hospital enviroment but with the help from a very friendy Anglian Recliners we found the perfect one and it was ordered. 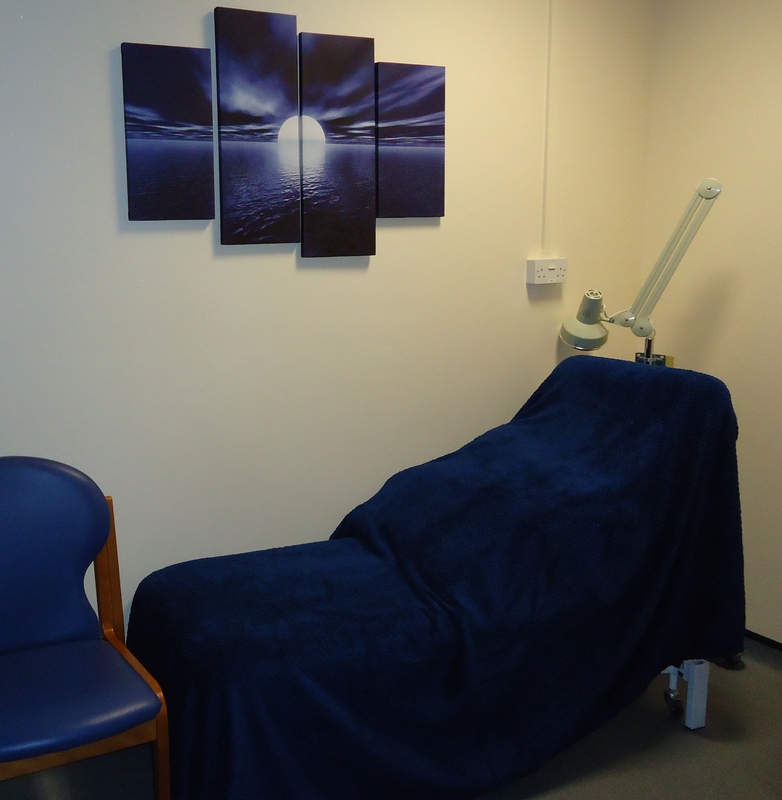 The next step was finding some relaxing and suitable pictures that could be put on the walls to make it less clinical for patients while they were having therapy. We think the ones chosen and pictured below are a good edition to the calmless of the room. We went to visit a sensory room in another part of the hospital and got ideas for the type of equipment that we would like to have in our room and this was a great help to us and the staff were very helpful and showed us many of the things working so that we could gauge what would be suitable for our needs. The support group is excellent at fundraising and Steve Spraggett along with Alan Herdman have raised lots of money for us for various projects, so we decided that the group would pay for the rest of the equipment needed so that it could benefit many Head & Neck patients and enable them to get help relaxing and coping with the stressful and sometimes freightening things they are confronted with. This is an ongoing project and we plan to add to the equipment that we have already bought. A "Bubble lamp" was bought and this changes colour while it is used and is one of the lights that can be used, we hopefully will be adding mirrors in the corners behind the lamp to add to the effect. We also bought a "Galaxy lamp" that puts the galaxy of stars which are always moving onto the ceiling and this can be used on several different settings. A "Mood light" was also bought that again changes colour and can be used in different ways to the lights above and all of this depends on what the patient finds most relaxing. We were all happy to be there and we would like to take this opportunity to thank everybody who gave of their time and resources towards this very valuable ongoing project.